At the 48th annual Independence Day naturalization ceremony at Thomas Jefferson’s home at Monticello on July 4, the featured speaker was actress and comedienne Tracey Ullman, who has won seven Emmy Awards® for her work in television. Her self-named Fox-TV show of the 1980s introduced the world interstitially to The Simpsons. 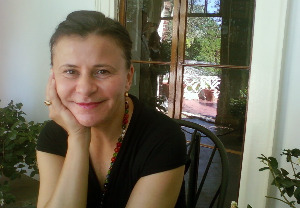 Ullman is a dual British-American citizen. Born and raised in Slough, England, she has lived and worked in the United States for 25 years and became a naturalized U.S. citizen in 2006. After the ceremony, Ullman sat down for a one-on-one interview with the Charlottesville Libertarian Examiner, answering questions about citizenship, the American dream, and what she finds valuable in the American founding. Noting that it was recently revealed that, in his draft of the Declaration of Independence, Thomas Jefferson wrote the word “subjects” and smudged it out so he could replace it with “citizens,” Ullman talked about the difference between “subject” and “citizen,” because she has been both. “Yes,” she said, “I have been a subject and now a citizen and it’s interesting. I just think that we are equal. There’s no one better than us. We’re not paying people millions of pounds to be better than us,” as the British pay their royal family. When she was growing up as a girl in England, Ullman absorbed many images of America that she saw on television. What most impressed her, she said, “was the Olympics,” not only because American athletes won so many gold medals, but “it was the confidence,” they exhibited. Since Ullman so recently went through the naturalization process, she spoke about the most surprising things she learned as she prepared for the citizenship test. She was most impressed, however, by the Bill of Rights and the Declaration of Independence, which is why, she said, it is so inspiring “to be here, where Thomas Jefferson” lived. He was “so forward thinking,” for his time, Ullman remarked, and that is why she remembers “really being impressed with the words of the Founding Fathers, in particular Thomas Jefferson, who was just so enlightened and so brave and so incredible at that time and still holds up” today. Publisher's note: This article was originally published on Examiner.com on July 4, 2010. The Examiner.com publishing platform was discontinued July 1, 2016, and its web site went dark on or about July 10, 2016. I am republishing this piece in an effort to preserve it and all my other contributions to Examiner.com since April 6, 2010. It is reposted here without most of the internal links that were in the original.